I thought it might be interesting and perhaps helpful to anyone thinking of walking the Camino to highlight some of the gear I took along. I’ll preface this post by saying I’m not a health expert of any kind, so any opinions I have about staying healthy on the Camino are just based on my own experience. This is particularly true of my feelings about footwear, which seem to contradict nearly everyone else’s who we met. This is not an exhaustive list. The goods that pilgrims choose to bring are as diverse and personal as the reasons they have for doing the Camino. Taste, time of year, and personal preference should all weigh heavily in what to throw in a Camino-bound pack. I will say that although walking 500 miles through the microclimates of northern Spain is challenging, the Camino for the most part is not a technical expedition. This isn’t Everest or the Appalachian Trail. We were never more than an 18-km walk from the next town, and the half dozen or so cities along the way have just about every luxury or emergency supply you’d need. I chose to stick with my Asics trail runners. I bought a new pair of GT-2160 about a month and a half before our trip. Though a beefier sole might have been nice for the constant rocks and the significant portions of roadwalking required by the Camino, I was happy to go with a shoe I knew. I avoided the serious blisters that seemed to accompany every pair of high-top boots we saw along the way. Yes, my feet were sore in a way I’ve not experienced while backpacking on the AT and PCT in the States, but again, I think that’s more a function of the trail substrate than my shoes. I’ll say that I do not have ankle problems. If you do, a high-top boot might be the way to go, as there are sections with some loose rock and the terrain can definitely be uneven. I will say that 500 miles pretty much destroyed the body of my shoes, though this might be due to my freakishly wide feet (at one specific point). The soles are worn but are still in good shape. We only had two significant rain storms our entire 28 days, and even those were fairly short. My feet got wet as these shoes aren’t Gore-Tex, but this is something I’m used to as I backpack in the States with trail runners as well. In my experience, the occasional value of Gore-Tex is trumped by the extra weight and the increased perspiration it causes, which seems to cause blisters and other foot problems. 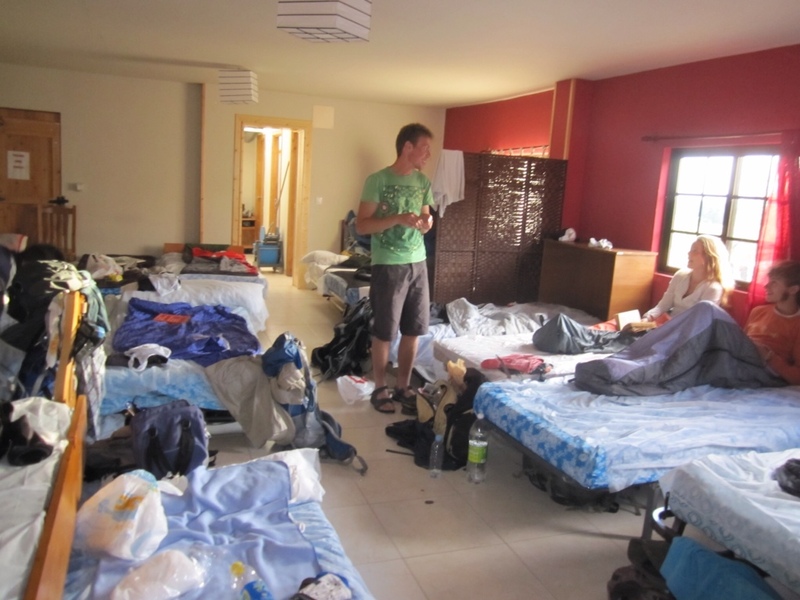 As we were staying in albergues every night, I was confident I could get even soaking shoes dry by the next morning. Plus, I had decent socks. I bought a 3-pack of Stoic wool-blend hiking socks from Steepandcheap.com for about $15. Someone had cautioned that these socks aren’t SmartWools, and while I definitely found that they wore out quickly (all three pairs were pretty much useless after we finished and ended up in the trash in Santiago), the kept my feet comfortable throughout the day. The outer layer pilled quite a bit from the get-go, but that didn’t seem to affect their performance too much. And they dried fairly quickly when washed by hand, though again, the fibers seemed to slough off in my hands as I scrubbed them. These socks are designated right and left, which after this trip I’m convinced is a racket by sock manufacturers. Let’s be honest – you’re not wearing burlap sacks on your feet. Every athletic sock worth it’s sweat-absorbing weight has a bit of elastic in it, so it should conform to the contours of your foot – either foot. All having right- and left-designated socks seemed to do was make each sock wear more quickly in specific spots, instead of more evenly with sock that end up on one foot or the other at random each time I put them on. If anyone has any information about how fitted socks might be beneficial, let me know and I’ll correct this post. Right now though, I can say that I would have gotten more mileage out of these socks had I ignored the “R” and “L” designations. 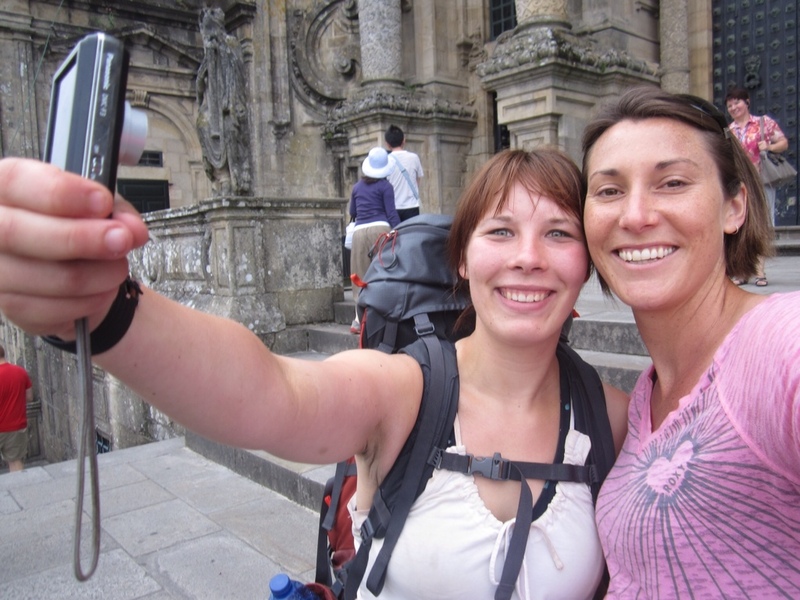 Pilgrims are easy to spot along the Camino even without their packs. They’re the ones wandering into mass with vented polyester shirts and doffing wide-brimmed nylon hats with chin ties in nice restaurants. If that works for you, great. I enjoy gear shopping as much as the next person. But after our travels last summer shredded a Northface polyester shirt that was a bit scratchy anyway, I decided to go with something a little more comfortable and durable. I bought a cotton-blend Kuhl button down before we left and wore it every day we hiked. I washed it by hand each night, and though it’s definitely showing some wear, I was very pleased with how it worked. Button downs allow more flexibility in regulating heat (i.e., unbutton a button if it’s hot, button up if it’s cold), they dry more quickly on a cloths line, and in a pinch, you look a bit sharper than if you’d just worn a t-shirt. My shorts are pretty simple, basically a light pair of swim trunks. A hat’s an absolute must for the Camino, as the sun can be fierce and you’re sometimes spending 12 hours a day in it. Forget about trying to hike only in the evening to avoid burning rays – you’ll get quite a bit darker, even up until the 9 p.m. sun in Spain. I brought along a light scarf, which was perfect for warding of the chill in the morning and for covering my neck from about 10 a.m. on. Sunglasses too were important, as the reflection off gravel paths and wheat fields can feel unrelenting at 3 in the afternoon. My favorite piece of gear is my Icebreaker sweater. Again a steepandcheap.com purchase, it felt a little overpriced even then at $55, but I wore it every day to stay warm while we were hiking, and then again in the evening. It’s held up very well, especially in the shoulders where I wear my pack. Best of all, it takes a lot to make this thing smell bad. I washed it twice during the entire month, and while I wouldn’t go around hugging strangers, I didn’t earn the nickname “Pigpen” either. I was glad I threw in my trekking poles at the end. While I do feel a bit ridiculous with them, like someone who took a wrong turn on the way to the Alps, they’re a great help in climbing hills, help you lock into a rhythm on flat stretches, and are knee-savers on the few brutally steep sections that can last for 10 km sometimes. Nearly every pilgrim has at least one walking stick, some choosing to go the more traditional route and buying one of the ubiquitous wooden sticks that are for sale everywhere along the way. I took just a light silk sleep sack. It weighs almost nothing and kept me pretty warm while keeping the bed bugs at bay. Lots of other pilgrims bring more robust sleeping bags, and one or two nights I would have appreciated a bit of extra warmth. But I’m a pretty warm sleeper and most albergues have blankets (which smell like moth balls) that you can use. For me the space I saved was more than worth being without my sleeping bag. This was the most disappointing piece of equipment I brought. After years with a Kelty internal frame pack that was bent all to hell from too many bush taxi rides and tosses by baggage handlers, I got an Osprey Stratos. I’m working on a dedicated post for my experiences with this bag, but I’ll just say broken straps a week into a month-long hike don’t inspire confidence. The size I chose was just about right. It’s a 38-liter bag, what Osprey calls a daypack/light overnighter, but with a little thrift, this capacity was perfect for the Camino. It would, I believe, suffice for the traveling we did last summer as well. I’ll post my complete review of the Osprey bag soon. The day from Ferreiros turned into our longest of the Camino. We dodged Galician rainshowers for much of the day, but got caught in a short downpour in the mid afternoon. We spent some more time walking with Joe from Ireland all the way to Palas de Rei, which was about 35 km for us on the day. With the skies beginning to part and the promise of quieter villages a short walk farther, Anne-Claire and I pushed on, only to run into my greatest worry about the structure of the Camino. In village after village, hospitaleros had shuttered their doors for a Saturday night of rest, and what should have been an extra 3 km turned into our first 50 km day as we were forced to walk all the way to the city of Melide to find accommodation. We dragged ourselves into town around 9:15, and I had to keep myself from falling asleep in my soup during dinner. Every part of my body ached when we finally went to bed, though I was surprised at how little soreness I had the next morning. Apparently, there are cumulative health benefits to be had from walking 12 to 30 miles a day for almost a month straight. The next night’s bed wasn’t nearly so tricky to find, and was perhaps our most comfortable on the Camino, a welcome treat after our penultimate day of hiking. We had a lovely dinner with an Irish doctor and his daughter, and two women, one South African and the other Dutch, who had met their first night in St.-Jean-Pied-de-Port and had walked together ever since. The South African woman had caught the eye of a Hungarian pilgrim with an injured leg, so she’d walk with her Dutch friend during the day, and then her suitor would typically come and find her late in the evening, just as he did during dinner on our last night. That evening, at the private albergue in Santa Irene (the public hostel was closed for repairs, joining the long list of unavailable accomodation in the final run-up to Santiago), the beds were so comfortable that we slept in until past 7 and set out on the trail for the very last time at 8:30. Though only 20 km or so, it felt like a long day as the anticipation of reaching our destination, indeed the namesake for the trail we walked, pressed us forward. The city of Santiago is visible for the last hour of the walk, the spires of the massive cathedral beckoning from the hilltop perch surrounded by modernity all around. As we walked the final few hundred meters through the old town to the cathedral square, we were greeted by street musicians – first a sitar player, then a bagpiper who, even late into the evening, seemed to be tirelessly heralding the arrival of pilgrims. We walked out onto the square, anchored by St. James’s church and flanked by a five-star parador and a monastery, to see the mishmash of tourists and pilgrims shooting photos, weeping, smiling, lying on the cobblestones, and sitting in reflection as they stared at the 800-year-old cathedral. It seems a lot of pilgrims don’t really know what to do when they arrive. “I walked all that way for this?” a Finnish friend of ours joked. But after weeks of walking, what would be a fitting end? The cathedral is spectacular, make no mistake – an imposing behemoth of lichen-covered granite that’s not as well-polished or restored as the cathedrals in Burgos or Leon. Indeed, it seems to be almost melting in the wet Galician climate. That gives it the feel of a church that’s alive and in use, rather than that of a preserved museum. It might seem cliche to say you realize the Camino, as with so much in life, is about the journey, not the destination. And yet, that destination that draws so many people to one place does have its importance, however arbitrary the place itself might be. 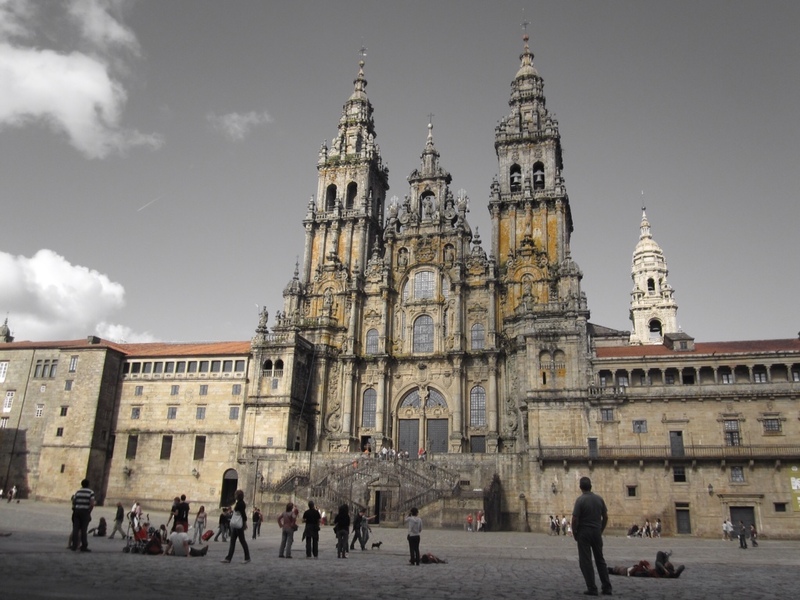 Whether it’s to mobilize Catholic Europe in the direction of Spain to oust the Moors as in the Dark Ages, or simply to provide a common path that allowed us to meet people from other cultures, the Camino is significant because it ended in Santiago. And yet, it seems many pilgrims aren’t ready for it to be over when they arrive. You see many sitting in the square late into the night. I imagine, like me, they’re pondering the totality of what they’ve just done, what it’s meant, and what to do now that it’s over. I suppose that’s why so many continue the three days further to the “end of the earth” at Fisterre. And now, it’s in vogue to extend the hike even longer and do another day on top of that to Muxxia, and even complete the loop back to Santiago for a second triumphant entrance into the city. To me the importance of what we’ve done over the past 28 days hit me the next morning when our friends from the trail began pouring in. Anne-Claire tells me we got just a glimpse of this excitement, as we had to catch a bus to Portugal that morning and weren’t able to hang around Santiago the rest of the day. “It’s your city for the next few days after you arrive,” she said. Indeed, as we walked back to the square from breakfast the morning after our arrival, we saw several of our friends from various points along the way still shouldering backpacks and beaming from the completion of their journey. It was Anne-Claire’s favorite part of the Camino when she and her dad did it a few years ago, and after a taste I can see why. Arriving in Santiago isn’t about seeing the Cathedral or visiting St. James’s bones or hugging his bust on the altar of the church. It’s about sharing a moment or two where you’re happy to see a familiar face, a chance to relive a happy memory because that face reminds you of a meal or a drink or a stretch of trail that the two of you shared in the midst of your disparate journeys. As I mentioned early on in this blog, the idea of taking a month to walk a distance you could cover in a day by car can feel a little contrived, especially as the backbone of the Camino feels like it’s breaking at times under the weight of its own popularity. Stretches of the path have become commercialized as local populations see a few euros to be made and start catering to us pedestrian-tourists in the form of meals, trinkets and housing. And who can blame them? One of the more lucrative ideas seems to be to build a cross between a hotel and a hostel, offer a limited number of beds in the shared housing section for the going rate of 5-10 euros a night, and then when that’s full, have a bunch of spartan rooms (“habitaciones”) at 30-60 euros a night that weary pilgrims are more inclined to pay for than to walk another 5 km to the next hostel. Still, the quintessential pilgrim experience crops up more often than not in spite of these complications. 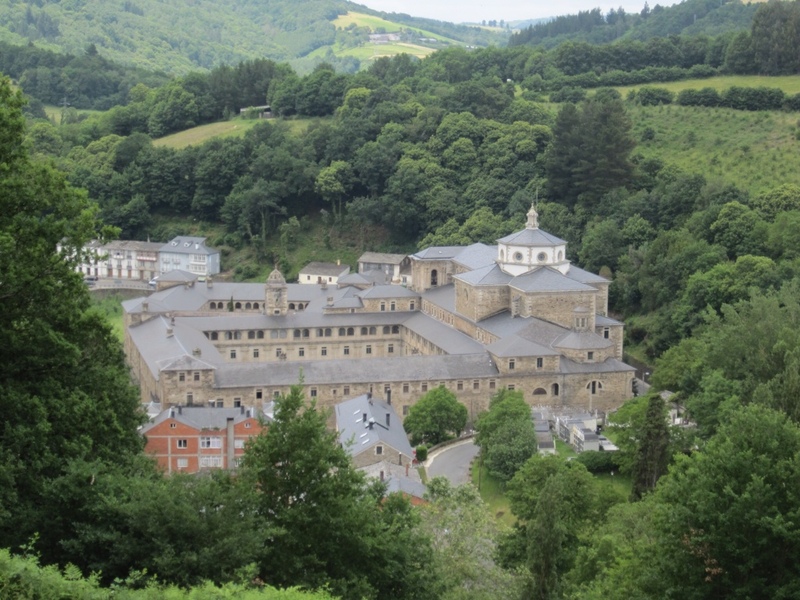 A few days ago, after descending from the spectacularly placed hilltop town of Cebreiro – the highest point on the French Camino – we stayed in a town called Samos in one of the oldest, if not the oldest, monastery in Spain. Once home to hundreds of Benedictine monks, fewer than 20 brothers now call the massive complex home. Anne-Claire and I had both gotten a little run down and weren’t feeling well that night. 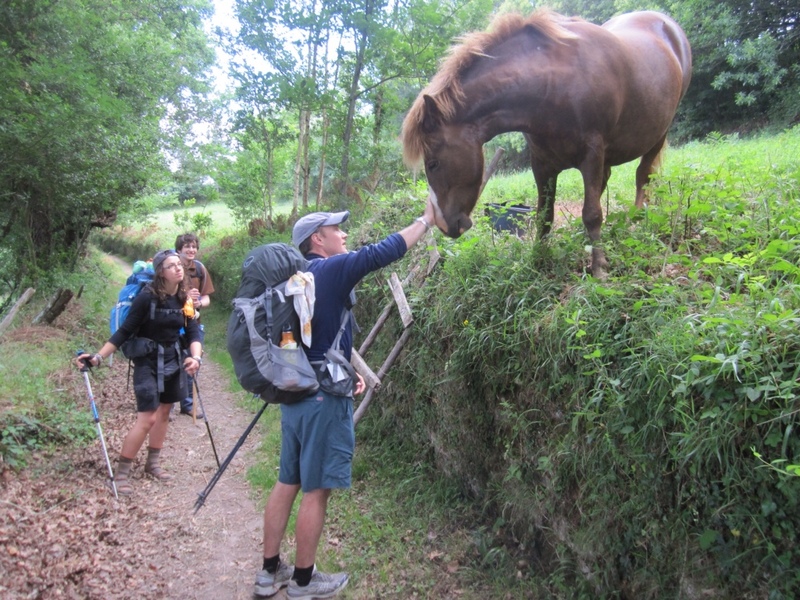 We’ve noted that if ever there was a good way to spread disease, the Camino is it. 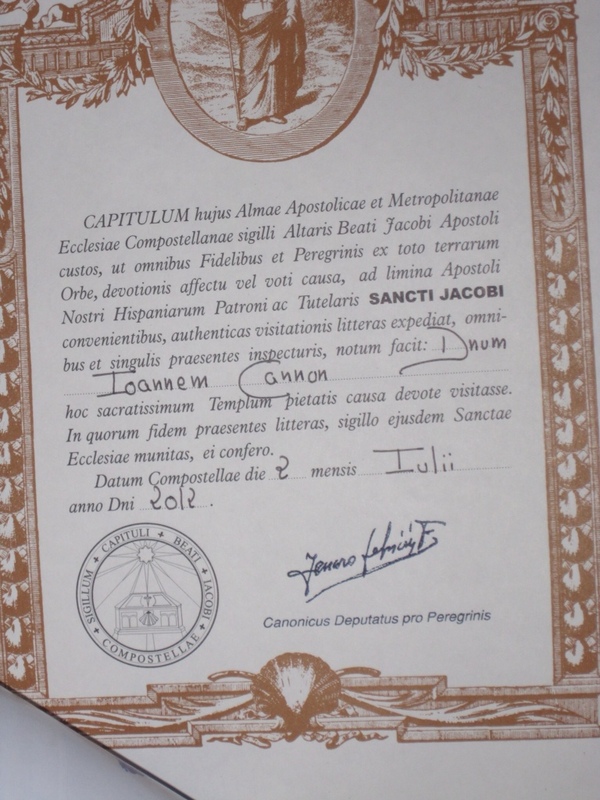 Take a bunch of tired, underfed pilgrims who are constantly meeting and remeeting people from all over the world in the Jacob’s ladder that is the social system and watch as viruses make the trip faster than we do (funny that “Santiago” or “Saint James” translates to “Jacob” in several languages). One hundred kilometers to go with Joe and Anne-Claire! We left Samos engrossed in conversation on the topics of foreign affairs, religion and the Irish language with Joe from Dublin and Mareade from Cork. Though probably one of our slowest days speed-wise, the miles fell quickly behind, as our companions are both fascinating people. Joe’s a brilliant polymath working on a doctorate in chemistry. And Mareade has a keen eye for observation unusual for someone of just 20 years old. Early in the evening, we arrived at yet another typical Galcian town where the livestock and the meters of elevation far outnumber the residents. We checked the first small albergue in Ferreiros and found it was completely full, but they directed us to the restaurant just down the hill. Out back, a tiny room crammed with beds stood surrounded by piles of lumber and building equipment. It looked like it had just been put up that afternoon (Anne-Claire even got some wet concrete on her shoe). A boisterious Swede named Kenneth informed us that the one shower for the 25 of us who would eventually sleep there that night had no hot water at all. This wasn’t strictly true. There was hot water if you put the handle in the middle instead of to either side, though so much of it shot sideways from the head that by the time it reached you, any warmth had been lost to the air. Kenneth said later that if he had been the plumber who had installed the shower, he’d have fired himself. But after almost 30 km, I was just grateful to rinse of the sweat and dust from the trail. We enjoyed a nice communal dinner, and then all headed back to our room around nine o’clock for bed. A loud generator was still toiling right outside the door, and a frustrated Italian, who had arrived after the shower had stopped giving hot water from any point on the dial, asked if anyone knew when the generator would turn off. Kenneth, by this point several bottles of beer and wine into his nightly routine (so we hear), piped up immediately and offered to take care of it. Everyone laughed, but a couple of minutes later, the machine peetered out. As whispered conversations cropped up around the room in the pleasant silence, a shy Scottish guy of about 20 who’d said little to that point in the night commented to his girlfriend how nice it was that in a single room like this one with no bunks, it opened the door to freer conversation. Indeed, we were all on the same plane and in for what we figured would be one of our most interesting nights’ sleep on the Camino. Magically, as the sunlight dimmed the ambient light (the only light available, come to think of it) in the room, everyone settled into bed around the same time, and I drifted off for a very restful night. 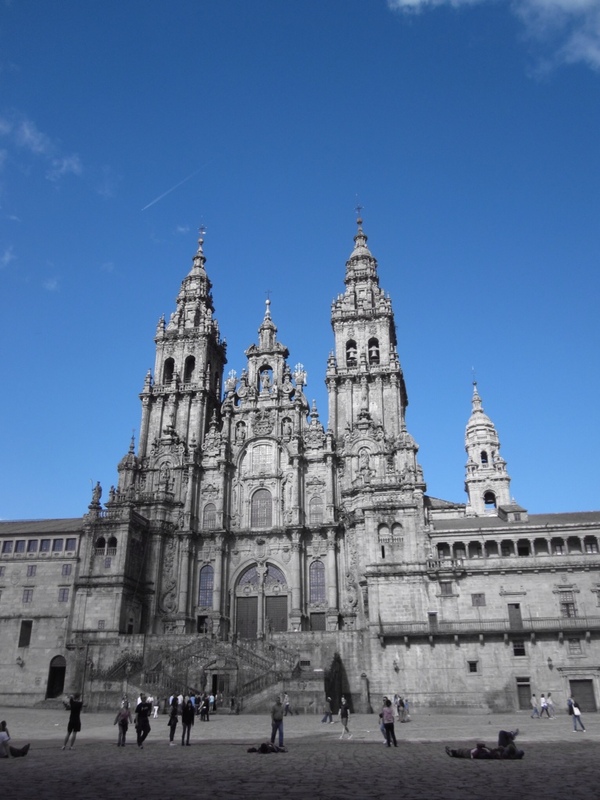 Pilgrims come to the Camino seeking truth, enlightenment, religious revelation and answers to every possible question. More power to them, I suppose, if they’re successful. But it’s nights like the one we spent in Ferreiros that have crystallized its value for me – realizing that under layers of class and background and every other label we proudly affix to ourselves, we all share the same longing for a few basic things in life, a good night’s sleep not least among them. A quick update on where we’re at – we are just finishing our stretch in Castille and Leon and are at a hostel tonight in Villafranca del Bierzo before the climb tomorrow to O’Cebreiro and Galicia. I love beakfast. It’s my favorite meal of the day. 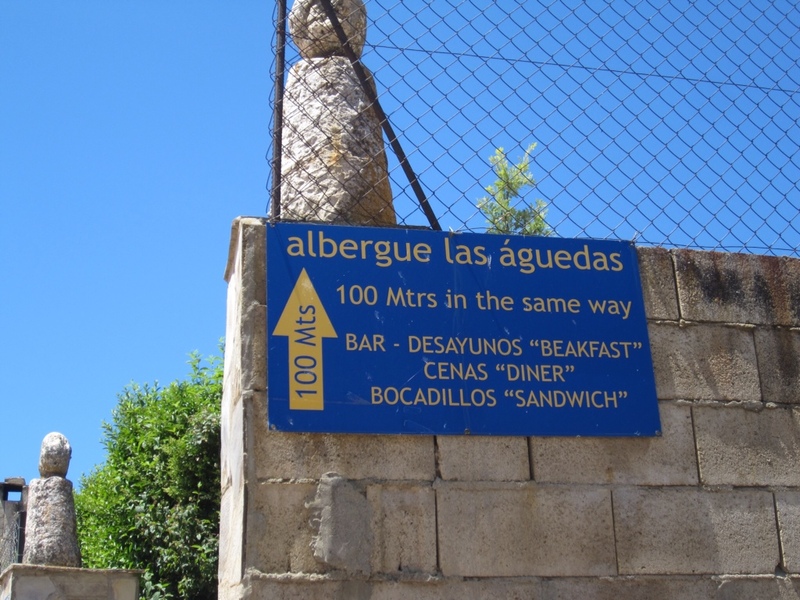 I have been impressed with the seemingly limitless patience of the folks who run the hostels – called “albergues” – along the Camino. The “hospitaleros” (and hospitaleras) face an unending stream of smelly pilgrims coming through day after day with dirty boots, oozing blisters and, for the most part, lousy Spanish. 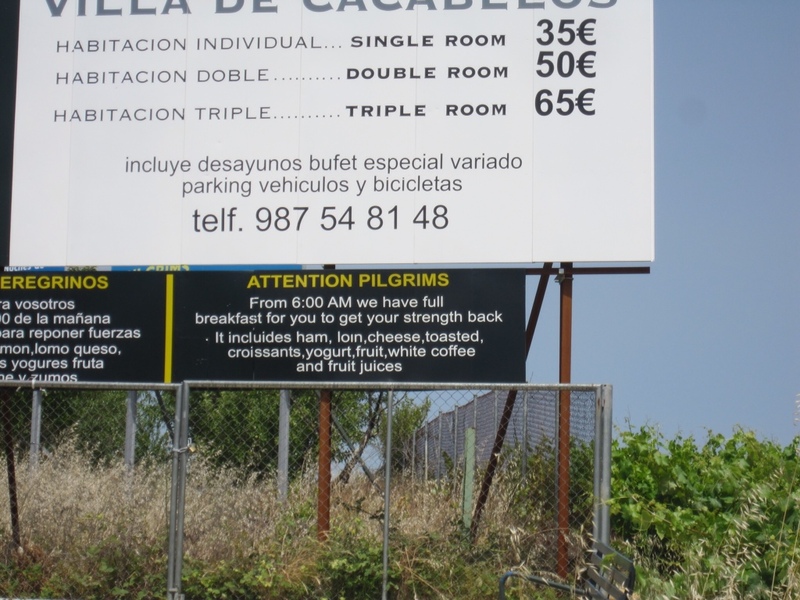 And all of us seem to expect the unique Camino experience every night – enough tasty food, clean bathrooms and showers, and comfortable beds. In the little town of Zarinaquiguie, maybe 10 km from Pamplona, I found myself in the position of speaking the best Spanish in the hostel for most of the evening. A sort-of language savant showed up later who spoke French, Spanish, German, English and even a little Basque, though she was proof that just because you can speak a dozen languages doesn’t mean you should. She commandeered the evening’s dinner conversation with little interest in anyone else, and though she spoke perfect French, she failed to accurately interpret our Quebecois and French companions’ eye rolls – something I’ve always thought transcended spoken languages the world over. What’s not to love about loin and white coffee for beakfast? Anyway, back to my story – before she arrived, a German pilgrim asked me if I knew what was for dinner, and if it was fish, could I tell the chef he wanted something else? I grabbed the Basque chef as he buzzed around the dining room getting the table ready for dinner and told him that one of his guests doesn’t eat “fishermen.” Without batting an eye, he knew what I meant, and Frederick got a heaping plate of spaghetti, while the rest of us had salty bowls of baccalau. The chef genuinely seemed to enjoy serving us, so when we were finished, I made sure to tell him that the salad, the lentils, the soup and the fish were all “very, very beautiful.” He graciously smiled at me and bowed slightly before zipping back into the kitchen. Though I’m sure they appreciate it in some measure, the hospitaleros always seems to feel a little uneasy in the spotlight. Perhaps they were a little on edge when we asked them (in Spanish), “What…is…the soup?” Our server spit back something that sounded like “hegetales,” which should have been easy enough to translate into “vegetables,” but our minds were elsewhere and we didn’t make the connection. “What…is…vegetables?” I asked in Spanish. “Vegetables are vegetables, you idiot. Carrots, onions, cabbage, potatoes…Vegetables.” I have no idea if this is actually what she said to me, but I let my imagination run a bit as it slowly sunk in that it was vegetable soup she was talking about. I’m just trying to imagine how an American in a town of a few thousand people in the United States might respond to a bunch of foreigners yelling demands at her in four languages, interspersed with shouts of “Sante!” and “Salud” and “Proust!” and “K Pis!” (Apologies to our Dutch and Finnish friends – I should have asked them to write down their respective toasts.) My estimation is that an American waitress, even one who depends on tips, would quickly lose patience with us. Thankfully, it seems the Dutch were forgiving, as they seemed to harbor no ill will this morning, probably thanks to Daniel’s efforts. I suppose even an attempt in a common language has the potential to heal wounds. We spent an extraordinary night last week in Carrion de los Condes, a pretty riverside village where we bunked in a convent run by a team of feisty older nuns who herded us to our beds like sheep, even though one of them couldn’t have been more than four feet tall. In the evening, we had dinner with our French-speaking friends. It was certainly a highlight of our time together – lots of laughter, Daniel’s toasting and delicious food. Danielle brought his wife Jeanette to tears with his inability to pronounce “Oruho,” a Spanish brandy. After dinner, we scooted across the street where another order of nuns – Dominicans this time and much younger in this case – offer a nightly benediction for pilgrims passing through. One sat on the steps of the altar playing a guitar and three others join her in singing a Spanish blessing as the priest laid his hands on our heads one by one. We also met up with a fellow Californian, Nick, and an Italian priest named Giorgio who we’ve walked with a few times, so the evening was certainly a nice boost. The next day, we had a flat, long stretch of about 18 km with no towns. Luckily, it was overcast and cool, making it an easy walk. 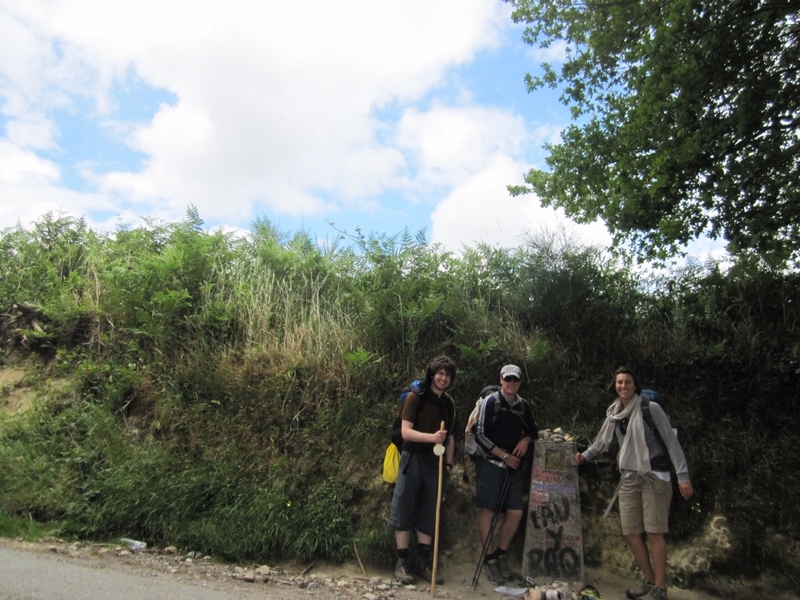 At one point, we walked for a bit with a team of French people helping a man in a wheelchair do the Camino. From what we could surmise, there’s a big group and they take turns in teams of three scuttling him along the route. Often they sing as they walk. Daniel and Jeanette made a point of walking with them for at least half an hour and singing songs with them the whole way. Apologies for the shaky video. The experience in person was moving to say the least.